Fun outdoor games are typically geared toward children or young adults and many of these games hold a childlike simplicity, such as guessing an item or spotting an animal. However, there are outdoor games that can appeal to adults because of their competitive nature and physical demands. You can entertain those your own age by reserving a spot outdoors for fun adult games. Depending on the thickness of the rope used, tug-of-war can be increasingly physically demanding on all players, providing a significant strength challenge. To play, divide all members into two teams. Both teams are to be equal in quantity of players and, ideally, physical strength. The teams are separated by a definitive line that no member can touch or cross. 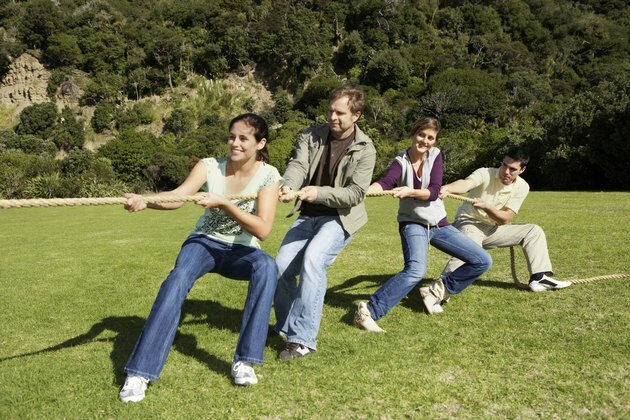 Each member of both teams is to hold on to the rope with both hands in an attempt to get the other team to release their hold of the rope or touch the line. If the line is crossed or touched by a team member, that team is disqualified. For added fun, swap the line for a mud or water puddle. Sack races can also be very demanding, both physically and in terms of balance. To start, identify the track on which the players will race, using demarcation to define the finish line. Next, split all players into pairs and give each pair one potato sack or large trash bag. Each player is to place one leg in the sack or bag. All pairs are to line up at the starting line and race until one pair finishes. For added complexity, place obstacles, such as water puddles or small dirt piles, that each pair will have to avoid. Be careful, however, as players are prone to falling in this activity. Bowling is a competitive sport that requires good hand-eye coordination. While makeshift bowling has different rules, it possesses the same competitive nature and requires the same coordination as typical bowling. To set up, gather empty soda bottles or similar items and fill them with rice so they can be knocked down by the ball but sturdy enough to withstand any wind. Each player will take five consecutive turns rolling a sturdy ball toward the bottles from a set distance, attempting to knock down as many bottles as possible. A record of how many each player was able to knock over should be taken. The player who is able to knock over the most bottles wins. For a longer game, try playing while adhering to classic bowling rules and scores.